Any business or manufacturer that uses hazardous liquids in some way will understand the caution that must be exercised. Not only are there potentially massive dangers for staff, but the environment and local wildlife will suffer profoundly if hazardous waste and liquid isn’t treated with, and disposed of, with care. For this reason, the law in the UK is very clear. All those who manufacture, import or supply chemicals currently need to comply with the CHIP regulations (Chemicals Hazard Information and Packaging for Supply), but from June 2015 this will be replaced by CLP Regulation, which focuses on “classification, labelling and packaging of substances and mixtures…in all EU Member states”. A new set of hazard pictograms will be introduced and be brought into effect, and though this has been gradually phased in since 2009, it’s a long process. June 2015 serves as more of a deadline, when the CLP classification will become mandatory. Storing hazardous chemicals in the correct containers is just as crucial as clear, legal labelling. The material, volume and closure of the containment all need to be considered thoroughly, so as not to cause accidents or a reaction. When choosing the material, consider what the substance will and won’t react to or damage, for example acids shouldn’t be stored in metal. A new IBC from Delta comes with a galvanised cage for extra protection, and flammable products can still be stored in them because they’re antistatic – protecting them from explosion as a result of electrostatic discharge. Spill prevention can also be an issue for those storing hazardous chemicals, liquids and waste, so pairing an IBC with a Bund is essential. They contain spills and excess, which can be incredibly dangerous and corrosive if not contained. This is crucial for the health and safety of all staff, customers, clients, and anyone who might visit your workplace. When storing liquids, it’s paramount that you don’t mix them with solids - they must be stored completely separately. They should also be filled to a particular limit, allowing for some ‘head space’. This makes transit and moving the container much easier, and makes the liquid much more stable in its storage condition. 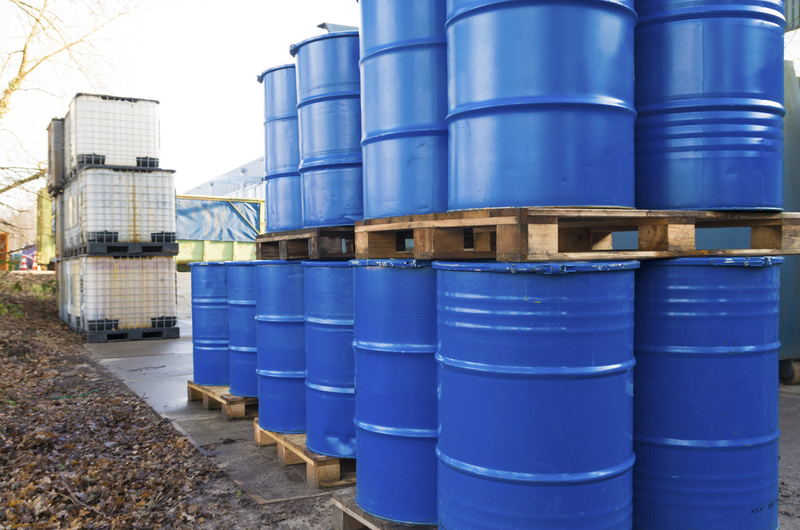 If you’re storing oils, they can often be recycled under particular circumstances, but not if they contain “solvents, halogens, laboratory chemicals, or fuels”. Both varieties also shouldn’t be stored together for this reason. And it’s not just the materials that can sometimes be recycled, the container can too. The Delta Group recycle post-industrial packaging and “annually process over 1000 tonnes of waste plastic packaging”, meaning that all unwanted, used plastic can be sold and reused – a positive step towards sustainability in manufacturing.